Zitting Cisticola (Cisticola juncidis) at home on grass stalk at Orient Station, southeast of Ingham. So natural and everyday. But stalking Zittings for years has delivered few clear closeups, except with the birds on barbed wire: not so natural. Naturally I'm delighted. Toddled off to Wallaman Falls today and found Southern Cassowary (Casuarius casuarius) paddling in a mud puddle. Showing off killer inside toe. Bit of a cough or sneeze. And finishing off with a nice bite of clay (known to counter toxins/deficiencies in diet). ... and flowing by the camping area. Rare find today at Jourama Falls as this Square-tailed Kite (Lophoictinia isura) circled near the camping ground before dropping from sight amid trees on the other side of Waterview Creek. My first sighting of the species for some years. Pity about the picture. ... and also along Orient Station road. And little Australian Hobby (Falco longipennis) sitting in middle of back road the other day. Inched up for capture (and trip to vet) when bird flew off without hint of harm (in spite of seeming breast wound). Happy days! Standing out among raptors near Orient Station lately, an industrious Spotted Harrier (Circus assimilis) quartering low for quarry to spook from long grasses and flooded hymenachne. Bird has received cool reception from resident pairs of Brown Falcons and Black-shouldered Kites, and local Black Kites, but aerial exchanges too far off for worthwhile pictures. But here's a Black Kite (Milvus migrans) coming a bit closer along the highway at Cattle Creek the other day. And this young White-bellied Sea-Eagle (Haliaeetus leucogaster), perhaps in second-year plumage, showed up with a sibling and an adult (presumed parent) this week. Bit of luck at the end of Orient Station road today with Mangrove Robin (Peneonanthe pulverulenta) giving away nest site. Bird sits neatly in cup, which sits neatly in thick fork of dying mangrove. Here's a closer look at one of the nesting pair, taken previously. Elsewhere along the station road recently, pair of Brown Quail (Coturnix ypsilophora) venture briefly from cover. And an Australian Bustard (Ardeotis australis) does a little morning preening and flapping. Many mornings, few returns from Jourama Falls lately, seeking clear view of Buff-breasted Paradise-Kingfisher (Tanysiptera sylvia). Bird above one of two still in area, so chase goes on. As does quest for closer looks at Azure Kingfisher (Ceyx azureus), along same section on Waterview Creek, not far from base of falls. But all the ambling on the road, stumbling along the creekline and bumbling through the forest has turned up a first for the falls: Grey-headed Robin (Heteromyias cinereifrons) seems taken by dark patch beside creek, barely above sea level, when its usual habitat is higher in the ranges. Right at home beside the robin is this Australian River Turtle (Emydura spp. ), showing the cheek of one too often given an easy feed by those who can't resist chucking bread at anything that moves in or on the water. 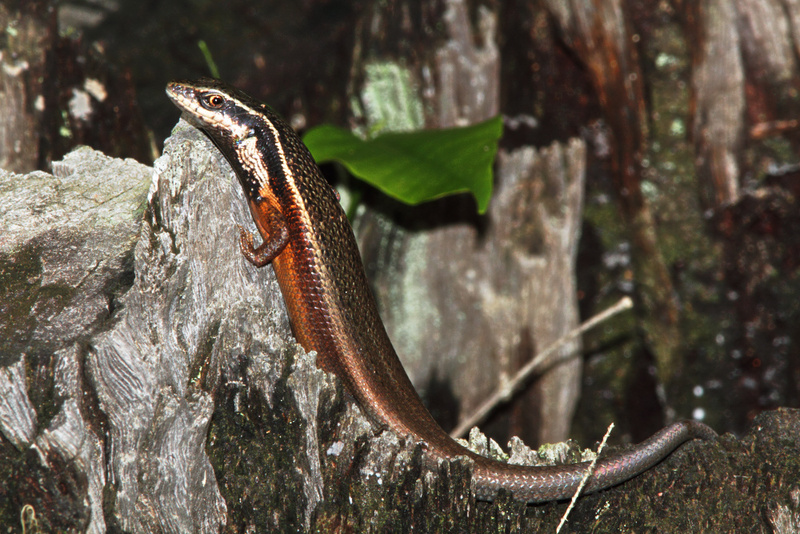 They should know better, said Carl, one of my many morning mates, a sharp-eyed Black-throated Rainbow Skink (Carlia rostralis). Even wholegrain is bad, but these nongs are all white-breads.